I did it: I cooked with fresh strawberries during strawberry season. During this time of year, I usually can’t bring myself to do anything other than eat the sweet, juicy berries plain. Somehow, though, I was inspired to whip up Strawberry Coconut Waffles and, to my surprise, they are more than worth it. Together, strawberries and coconut bring a tropical vibe to breakfast. Like the heat is beating down on you from a Caribbean sun. Just, uh, minus the ocean breeze (well, at least here in Brooklyn!). Okay, okay. These waffles may not quite make you feel like you’re basking in the island sun, but that’s only because they’ll have the kids begging for more, too. (Maybe these call for a switch from date night to date morning?) My kids went nuts for these waffles! And who can blame them, packed with sweet shredded coconut and bursting red berries. No matter how you serve these—or to whom—one thing is for sure: These waffles are a hit. You'll love them whether you’ve sent the kids for a sleepover and are enjoying a rare slow morning with your honey or you’re feeding the whole clan. A perfect summer breakfast. For best results, use homemade waffle mix. For every cup of waffle mix, you’ll need the following, along with any other ingredients called for on the package or by the recipe (e.g., eggs, butter). Also, if you can, substitute coconut milk for cow’s milk. 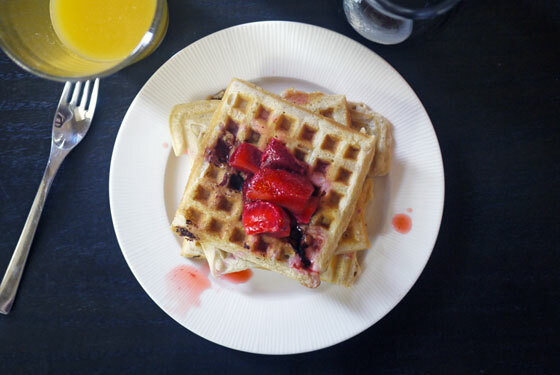 Step 1: Combine waffle mix with the ingredients called for on the package or by the recipe, substituting coconut milk for regular milk, if possible, and adding the shredded coconut and fresh strawberries. Step 2: Cook as directed. Serve topped with butter, additional strawberries and maple syrup.